This new range of certified organic seeds contains a selection of our most popular culinary and medicinal herbs and teas. 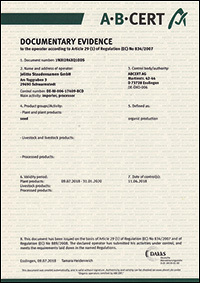 (Certification in compliance with EU Regulation No. 834/2007 and 889/2008). The seeds are identified by an "O" for "organic" as the second letter of our item code. Our company is listed under the No. 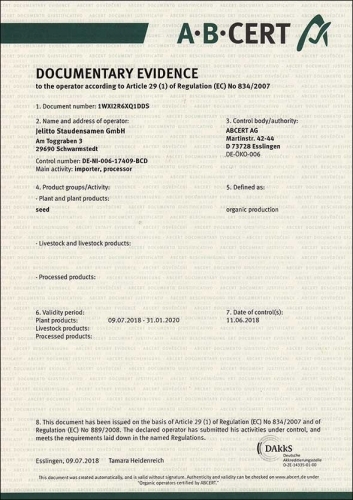 D-NI-006-17409-BCD / DE-006-ÖKO-Kontrollstelle (German certification body) and is subject to annual examination on the basis of which an EU organic food certificate is issued. This process guarantees transparency along the line from seed to consumer which is essential when dealing with organic products. Our certificate is accepted in the EU, Switzerland, Argentina, Australia, Costa Rica, India, Israel, Japan, New Zealand and Tunisia and can be downloaded at www.jelitto.com. Other countries have differing regulations for organic products. Unfortunately, there is no existing worldwide standard for organic certification. Please check with your local authority to determine if our EU certificate is valid in your country. As ultimate consumer you are in a position to choose the seeds you buy, with or without valid certification. It is up to you to make a contribution towards healthy, ecological products.